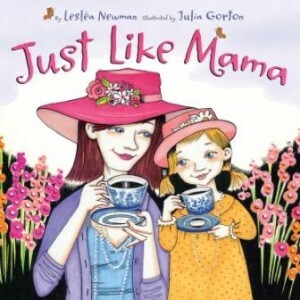 Lesléa Newman, author of Hachiko Waits, wrote a lovely book entitled Just Like Mama that hit bookstores last month. She collaborates with illustrator Julia Gorton on a tribute to motherhood, which is narrated by a little girl one summer day. Vegetarian parents will appreciate that while food has a special place in this book, the meals are ones that might be served in your house: apple pancakes and cocoa for breakfast, peanut butter sandwiches with apples for lunch, and spaghetti for dinner. While there are depictions of whipped cream and milk, they could easily be soy. I also like that the mother and daughter spend time together outdoors gardening and finding frogs. Some families concerned about animal rights, however, may not enjoy the part of the book where the pair plays dress-up and Mama pretends to be a “lion tamer” teaching her daughter to roar.